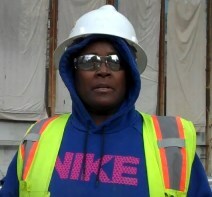 April Atkins, a carpenter for Safway Scaffolding, is one of several talented women working on the Transbay Transit Center Project. At a young age April became interested in building through her woodshop classes, and it became clear to her that construction would be her chosen career path. She started her career as a waterproofer and has now developed significant field experience. April has been involved in numerous projects throughout the City including 535 Mission, Cypress Mandela Training Center and Oracle Arena. She has particularly enjoyed the Transbay Project because she has a hand in creating a transit hub that will greatly benefit the residents of her home city.